I wanted to make something homemade - but being only 3 weeks until our new baby is to be born, I don't want to slaving in the kitchen for hours - just don't have the energy. This Nigella Lawson recipe is delicious and easy and impressive! I decided to create it as mini-cheesecakes for serving purposes and took them to a Christmas party as my "dessert" contribution. I will probably make another full size one for Christmas day and add some fresh cherries on top. Crush the biscuits to crumbs. Add them to a bowl with the soft butter and stir till all is combined and biscuits moist. Use a teaspoon to press the mixture flat and firm in the muffin cups. Pop in the fridge whilst you prepare the filling. You can do this by hand if you like, but I find it easier to just throw it all in the mixer if you have one. Beat together the cheese, icing sugar, vanilla and lemon. Lightly whip your double cream and fold it into the cheese mix. Gently spoon the cheesecake filling on top of the biscuit base/s and smooth. 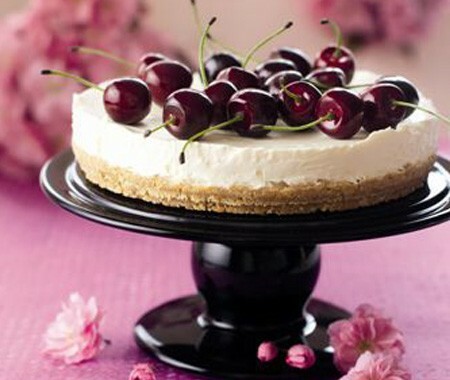 Put in the fridge for at least 3 hours or overnight for a full size cheesecake or about 2 hours for mini cheesecakes. When you are ready to serve, unmould the cheesecake onto a nice plate or cake stand and spread the black cherry over the top. Alternatively, I served the little cakes below each with a tiny spoon on a pretty platter.